Are these four words the way you would sum up a "family"? Hong Kong society's expectations of women are back in the imperial dynasties when it comes to images of them depicted in advertising. A lot of the ads I see in the MTR station or on television expect women to look beautiful -- have flawless skin, a big bust thanks to her push-up bra, and she has to have a flat stomach, in other words not eat. And if you have a family, then you have to be a perfect mother that dotes on her children and looks after her husband, because after all, he's the breadwinner. But statistically some 52 percent of women in Hong Kong work, compared to 65 percent men. And many of those women don't know how to cook, let alone have time to clean because they're busy working. The cost of living is so high in the city -- look at housing prices -- that at least two incomes are needed to keep a family afloat these days. So it was an affront to women in Hong Kong when they saw this ad for casual clothing brand Giordano a few days ago. Called "Team Family Series", it shows a "family" with each member wearing a different T-shirt. The father's says "work", mother's says "cook", while the two kids have "cry" and "play". If that's how one sums up a family it's very pathetic. Don't kids "study" and not just "cry"? An expatriate woman, who is also a mother was outraged when she saw the ad showing the mother as being stuck in the kitchen, and immediately went about shaming Giordano on social media for being sexist. Soon there was an onslaught of angry women criticizing the local brand for being way behind the times. Giordano did respond and said it had received a number of complaints, but added it was proud of its clothing apparel that is designed for everyone regardless of ethnicity, nationality, culture or gender. "We agree that the ultimate products could be a better way in presentation that is one of the many ways to presenting the love to family which did not reflect our entire true values," said a statement on Giordano's Facebook page. It added the words chosen for the T-shirts were meant "to depict different, random aspects of life." 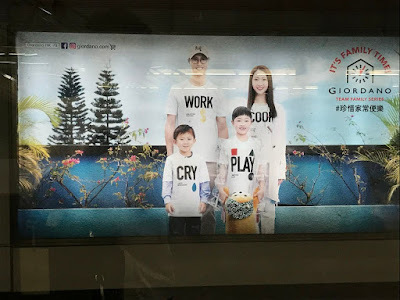 While many of the ads have been taken down, this one was spotted at Kowloon station, and the "Team Family series" is being sold in some stores. The worst thing about ads targeted at women in Hong Kong is that many men have expectations that women should look beautiful, flawless and perfect in every way. Many of the ads in Hong Kong depict fantasy rather than reality, and if it is the latter, it's how sad or pathetic real life is. Advertisers and advertising agencies have to take some responsibility for their depictions of people and life. Or is it consumers who can't face the reality of life and advertisers are trying to provide some kind of aspiration?